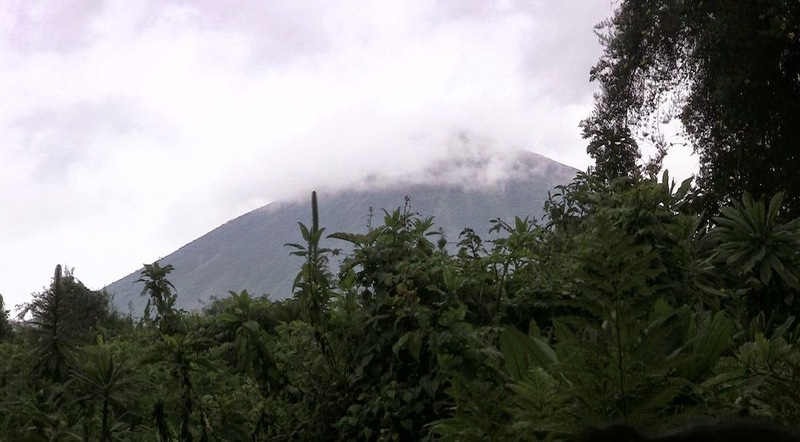 After visiting Bweyeye and Gishwali our third trip, the Volcanoes National Park. A national Park along the northern border of Rwanda with the Democratic Republic of Congo and Uganda which was set up in 1925 (originally Albert park: named after the Belgian King) to protect the last of the mountain gorillas. Since it was set up, the boundaries of this park have been continuously eroded by agriculture, cattle farmers but also on more than one occasion since 1979 by the government as a solution to the rapidly increasing population but also to allow for the cultivation of pyrethrum (a bio insecticide). In 1960 it was 34.000 hectares, but now only 16.000 ha remain which now come under Rwandan State protection. From the foot of volcanoes to the summit four distinct vegetation zones can be differentiated. The bamboo forest zone (Yushania alpina) between 2500 and 3200 m above sea level. The alpine zone where only a few grass species, mosses and lichens can be found. The next few days we stayed in the slopes of the volcanoes looking for edible mushrooms from the rainforest. Looking out for the local gorillas!